A design for an assault tank to break through enemy defensive lines. The design was completed by May 15, 1943. 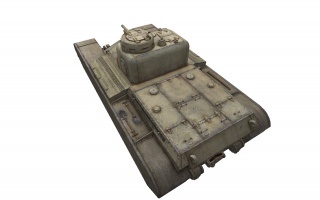 No prototypes were built, but the project helped to set the stage for another heavy assault tank, the A39 Tortoise. The AT 2 is radically different from its predecessors: it's the first true non-turreted British Tank Destroyer in its line. 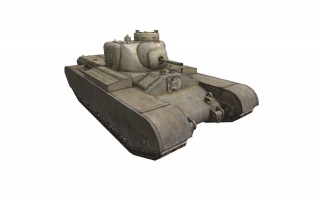 The AT 2 was well known for being tough as hell, boasting the highest armour in its tier. (Rivalling even Tier VIIs) and a high HP pool (450). This vehicle's robust nature gives it the ability to endure heavy bouts of punishment before falling and returning this much hurt in its gun. For this amount of armor, the AT 2 is slow on the straight and turn so open-fielded maps wouldn't offer much to make the most of its protection. With SPGs free to take pot-shots as it trundles its way up a hill. 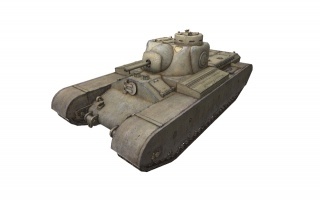 Unfortunately the AT2's armour was significantly nerfed in the December 2017 updates, meaning that it is now possible for the AT2 to be two-shotted, and greatly increasing its vulnerability to artillery fire. Other buffs were added to compensate such as greater damage output and speed but above all, it's best to be skilled to use the AT2 correctly. - Even its armor was "nerfed", it still boasts incredible armor. Great for taking in the punishment for less-protected tanks or as part as a diversion. - Top 6 pdr has a very fast RoF, aim time, high DPM and good accuracy. - Abnormally high HP pool for a TD. - Decent Top radio, but not the best, which can be a pain for such a slow tank. - Armor has been halved, post-update, meaning the AT-2 is much easier to destroy. Skill is needed to make the use of these new changes. - Small angles of gun traverse meaning the tank needs to turn often. With very thick frontal and awesome rear and side armor, the AT 2 is an intimidating opponent. Even though it's extremely well armored, it has weak spots that are easy to hit up close, a very slow top speed, and a sluggish traverse speed. Furthermore, its armor is weaker than advertised, especially around the gun mantlet and the upper glacis. It is very easy to get knocked out at close range, be it from weak spot snipers or faster tanks. Do not get overconfident with the AT 2's armor. In a Tier 5 battle, the AT 2's armor is very difficult to break and most shots to the rear and sides and be deflected with simple angling. Always be mindful that the armour is less reliable now it's been nerfed - an average or below average player is unlikely to block 2000 damage every game any more. The accurate and rapid-firing 6-pounder gun offers good damage per minute and ensures no enemy wants to stay in your path, no matter how tough they think they are - you will quickly be able to find weak spots. 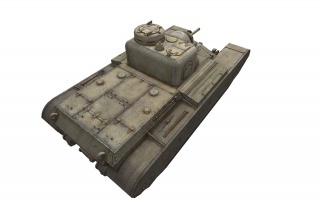 The AT 2 is very very slow, comparable to a Maus. Its top speed keeps it at a modest speed even when downhill. Furthermore, the weak engine power means running into trees and stone fences will result in a serious speed decrease. Speed is the biggest flaw of the AT 2 and makes it a tank that is reliant on its team to protect its rear and to spot for it. The AT 2's weaknesses can be minimized by playing with constant support. Once you manage to make it to the enemy you'll find the AT 2's excellent armor and good gun extremely rewarding. The 3.7-inch AT Howitzer and WS No. 19 Mk. II Radio carry over from the Alecto. Mount them immediately. Research the QF 6-pdr AT Gun Mk. V and Nuffield Liberty Mk. III Engine in whichever order you want to. Finally, research the AT 2 Mk. II Suspension. AT-2 is a Nuffield Mechanizations Limited design from May 1943. Total weight was estimated at 41 tons, and the vehicle was running on torsion bar suspension. It was introduced along with the AT-1 design, which had a turret that could mount a 75 mm high velocity gun or a 95 mm howitzer. With AT-2, it was decided an assault tank doesn't need a turret and so it was replaced with a fully enclosed superstructure. Both designs shared the same hull, but since AT-2 was supposed to have a casemate construction, it should have been around 4 tons lighter, and considerably cheaper to produced compared to the AT-1. 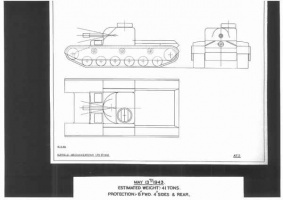 No historical records of the AT 2's armor values or performance specifications exist. This page was last modified on 31 October 2018, at 19:23. This page has been accessed 256,137 times.